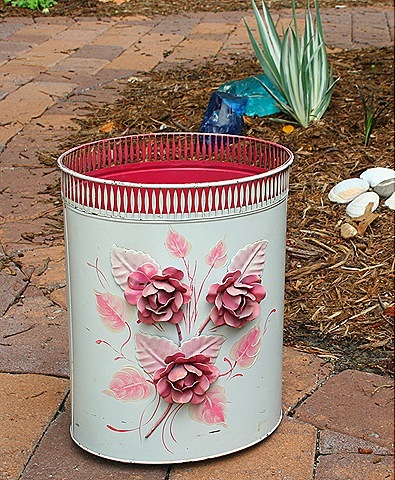 I just keep stumbling across these awesome vintage trash cans this year. What's up with that? Last weekend while I was spending a few days with Beth we attended an incredibly fabulous estate sale. The first thing I nabbed as I ran down to the basement was this unbelievably cool vintage can. It's a barely there shade of light green with gorgeous enamel metal flowers and hand painted leaves. I love the cut metal trim on the top and it's painted pink on the inside. You can't see them, but it has little metal ball feet too. Now it's been spray sealed, holes drilled in the bottom and plants added. I’d have grabbed up these trash cans you’ve come home with also. I love the way they look. Imagine that? Loving trash cans! This is a beautiful vintage can. What a find. I’ve never seen one so pretty. Wow, this one’s special and fancy. Since your post on putting them in the garden…I haven’t found one yet! and I love the idea. guess I need to show him your pictures. THAT is a wow for sure!! How do you do it? This is too gorgeous! I have been looking for a cute trash can! Lucky girl! 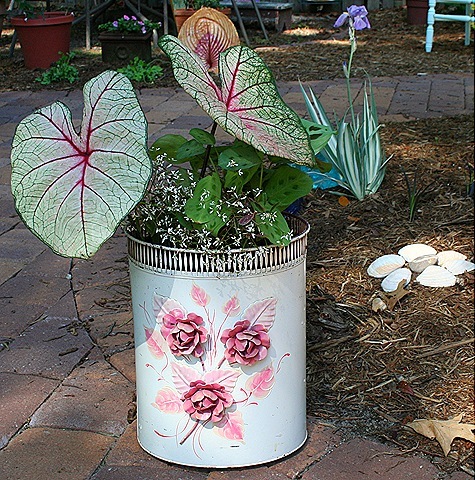 I love your “trashy” find, and your inspiring idea to use it for a planter.